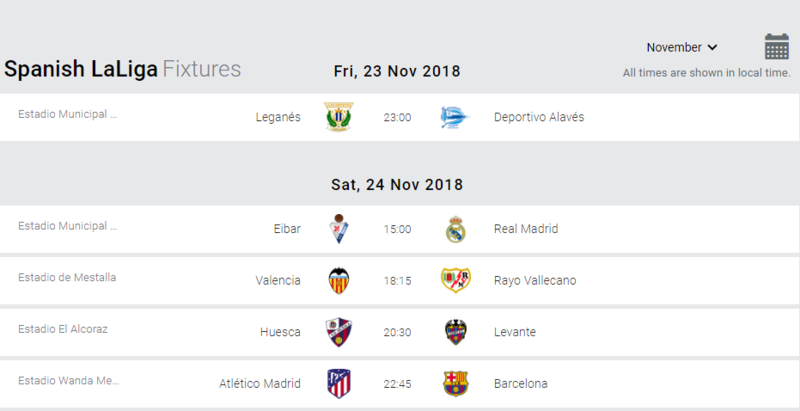 This first match this weekend in La Liga comes from Butarque on Friday night. It’s a big one for the visitors who would take top spot for 24 hours at least with a win. Leganes were the surprise package this time twelve months ago but they currently sit in the bottom three and will be motivated by the possibility of climbing out of the drop-zone here. It’s not a great surprise to see Leganes struggling. They sold arguably their best player in the summer in the shape of Gabriel Pires and didn’t do a great deal to add quality to their squad. Mauricio Pellegrino was always going to have a big job on his hands but will take some comfort from his side’s home displays as he prepares to lock horns with the club he successfully managed two seasons ago. Leganes have performed pretty well in recent weeks but even so they are without a win in 5 matches coming into this and have only won twice all season, with one of those games against struggling Rayo. Alves have already won a tough Friday night game in Vigo this season to move into 1st place and many teams would buckle under that kind of pressure. Alaves have an excellent record of 6 wins from their last 10 away matches in La Liga. They kept a clean sheet in all but one of those victories and up against a Leganes side that has the joint 2nd worst goal-scoring record in the division, they should fancy this. Alaves haven’t won any of their last 7 matches against Leganes. 3 of the 4 top flight meetings between these clubs have produced score draws while Leganes won this fixture 1-0 last term. Marko Dmitrovic is injured so Asier Riesgo should feature in goal for the hosts. Pape Diop and Anaitz Arbilla are suspended so Gonzalo Escalante and Ivan Ramis are set for starts. Casemiro is the only first-team regular missing for Real who have their strongest back four fit again. Toni Kroos should occupy the holding role while Isco and Dani Ceballos are battling for a start in midfield. There have been 8 previous league meetings between these clubs with 7 Real Madrid wins an 1 draw. Real have won at Eibar in each of the last 4 seasons. This Saturday’s early game in La Liga sees Real Madrid under the permanent stewardship of Santiago Solari for the first time. He takes his side to Eibar and a ground where Real Madrid have never dropped points in the Spanish top flight. The Basques though can be awkward opponents on their day and will be hoping to cause an upset. Statistically speaking, Solari has made the best start of any coach in the history of Real Madrid. 4 wins from 4 during his interim stint helped earn him a three and a half year contract and the 4-2 win in a tough game at Celta Vigo last time out helped ease any doubts in his toughest test to date. Barcelona’s shock defeat to Betis means Real are now just 4 points off the top of La Liga and the damage from a dreadful start to the season appears relatively limited. Eibar meanwhile are currently 13th but have built a solid cushion on the drop-zone. Even though they finished in the top half last term, a club of their size and limited resources has to start every season with a survival-first mentality and in truth they’ve not looked like a side that is in any real danger of the drop. They come into this one following a 0-0 draw at Valladolid and having lost only 1 of their last 5 in La Liga. This is a jump up in class on their recent opponents though and it certainly feels like they are catching Real Madrid at quite a bad time, with Los Blancos coming out of a slump that lasted for at least two months. Eibar’s record against the ‘big three’ in La Liga is also very poor with just 1 point from their 8 previous games against Real Madrid while they’ve never beaten Barcelona or Atletico Madrid either since joining the top flight in 2014. Real meanwhile tend to enjoy life against Basque teams with their last 25 league games against sides from the region producing 20 wins and just 1 defeat. They’ve been scoring for fun since Solari took charge with 15 goals in 4 games under him and they look well capable of doing the business here against an Eibar side that has suffered 3-1 and 4-0 defeats in La Liga over the past couple of months suggesting there are defensive vulnerabilities that the top sides are capable of exploiting and the suspensions of Arbilla and Papa Diop won’t help matters here. The last 4 meetings between these clubs have been drawn in a sequence that started with a 4-4 Copa del Rey draw at the Mestalla. Valencia are unbeaten in 6 games against Rayo overall. The versatile Daniel Wass is set for another start at right-back even though Cristiano Piccini is fit again. Santi Mina and Rodrigo are likely to start up top here. Stole Dimitrievski could be drafted in to start in goal as Rayo aim to stem the flow of goals conceded. Alejandro Galvez fit to feature alongside Jordi Amat in central defence which should help matters. Valencia go in search of their first home win of the season in the Spanish top flight. Their opponents are a Rayo Vallecano side, who also haven’t won at home, but aren’t quite as bad as their current 19th place and meagre points tally suggests. It could be a nervy afternoon at the Mestalla but if they are going to achieve anything this season, they simply have to start winning at home. They did manage to do just that in their most recent outing on home soil, in the Champions League against Young Boys. They backed that up with victory at Getafe, just their second in La Liga this term to head into the international break on a high and they finally have some sort of foundations from which to build. Victory here could see them climb as many as 8 places such is the congested nature of the middle of the Primera Division right now. Victory for Rayo won’t move them out of the relegation zone but it would be a huge boost for Michel’s men who have been undone by a series of late goals in recent weeks. Midfielder Gonzalo Melero remains an injury doubt. It could be 5-4-1 again from Huesca with Cucho up top on his own and David Ferreiro and Serdar Gurler offering support from midfield. Winger Jose Luis Morales is suspended which is a major blow. Emmanuel Boateng should partner Roger Marti in attack. Midfielder Jose Campana is also banned. The only meetings in the last 8 years came in the 2016-17 Segunda Division with both meetings producing away wins. The last 7 meetings have produced 6 red cards. Saturday’s game features a Huesca side that has largely been written off by most Spanish football pundits already. Despite a bright opening few games, the wheels have fallen off since and they’ve already changed coaches but that hasn’t managed to get them off the bottom of the division. It has been a much brighter season for Levante but they also come into this one on the back of a defeat. That came at home, as they were beaten 3-1 by Real Sociedad with the Basque side scoring 3 times in the final 20 minutes to turn the game on its head. It wasn’t exactly the best way to head into the international break but the Valencia club remain well placed in 8th and with a strong away record that will give them confidence heading into this one. Huesca sacked Leo Franco and appointed Francisco 6 weeks ago now but the new man is still waiting for his first win. In fairness he has only had 4 games due to two international breaks but a return of 1 point from them is hardly what he or his new team needed. They conceded a stoppage time leveller in their most recent home game against Getafe and with some really tough games coming up, this one almost has the feel of a ‘must win’ fixture even at this stage in the season. Levante also have some significant absentees here with Jose Campaña, Ruben Rochina and particularly Jose Luis Morales certain to be missed. The latter is key to their counter-attacking game that has brought so much success on the road this term and that makes you question Levante’s ability to bag all the points here. Saturday’s clash at the Wanda is the standout fixture this weekend in La Liga and should offer up some real clues as to how this title race may develop. Victory for Barcelona would be a real confidence boost after a shock home defeat to Real Betis last time and would make it clear once more that the Catalans are very much the team to beat. However an Atleti win would see them move two points clear of Ernesto Valverde’s side and would further suggest this could be one of the most open title races in years. Atletico Madrid have achieved all kinds of extraordinary things under Diego Simeone however one thing they haven’t done is beat Barcelona in a league match. That in itself is remarkable given they’ve twice knocked the Catalans out of the Champions League in recent years not to mention won La Liga with a draw at Camp Nou. This would be as good a time as any to end that curse and with 4 wins from their last 5 games they are in decent form. Barcelona were in great form too but bizarrely the return of Leo Messi coincided with only their second defeat of the season as Real Betis won a 4-3 thriller at Camp Nou. They will face a different kind of test here against an Atletico Madrid side that are more adept at the ugly stuff and less willing to try and play Barca at their own game. Even so, this promises to be a good one and goals do look likely. Atletico Madrid’s defensive problems are one reason for that. All of their four main centre-backs have been carrying injuries and they looked far from assured in their last home game, only beating Athletic Bilbao 3-2 thanks to a last gasp goal from Diego Godin, who could barely walk by that point but still managed to convert. His central defensive partner for that game was 19 year old Francisco Montero and Simeone will be hoping he can at least field two fit senior centre-backs for this one. Barcelona have their own major absentee in the form of the suspended Ivan Rakitic but Philippe Coutinho is expected to win his race for fitness while Leo Messi again didn’t feature over the international break meaning he had a full fortnight to get geared up for this one. Messi did manage a brace in the defeat to Betis and has netted a huge 28 goals against Atleti in his career. Only against Sevilla has he scored more and backing Messi to score anytime looks good here at reasonable odds for once. Both these sides have been more vulnerable defensively this season and both have already conceded 4 goals in individual matches. Between them they conceded just 51 goals in La Liga last term but are already over halfway to that figure, just 12 games in this time around. Atlético are winless in their last 16 league meetings with Barcelona (D4 L12), their second-longest winless run against a single opponent in the top-flight (23, against Real Madrid between 2000 and 2013). Their last victory over Barca came in the Champions League, 2-0 at the Vicente Calderon in April 2016. Diego Godin is injured and unlikely to feature while fellow centre-back Jose Gimenez is also a doubt. Stefan Savic and Lucas Hernandez have had injury problems of their own but should start in central defence here. Atleti have few concerns in other areas. For Barcelona, the suspension of Ivan Rakitic is the only real selection problem for Barcelona. Leo Messi and Philippe Coutinho are both fully fit again and the main question is whether they go 4-3-3 or match Atleti’s 4-4-2. This is a significant game for Athletic Bilbao who have had a poor campaign so far and really need to start climbing La Liga as we head towards December. Getafe have had a mixed time of it and are perhaps struggling with the expectation levels which were raised significantly by an impressive 8th place finish this term. They will be hopeful of getting something from this Sunday’s clash in the Basque Country. Athletic did finally win a match during the international break although only in the shape of a penalty shootout after a drawn friendly with second tier Depor. They could have done with a more convincing display in a game that did involve some of their senior players, with few Basques involved in international fixtures. Their last proper win was way back on the opening day of the season when they saw off Leganes 2-1 at San Mames. Inconsistency has been Getafe’s main problem this season. At times they’ve looked very solid, beating both Seville clubs 2-0 but they do come into this one following a draw they salvaged late at bottom club Huesca and a home defeat to a Valencia side that had only previously won one league game all season. Having not won any of their last 11 league games, Athletic could actually equal a club record for winless matches if they fail to win this one and that wouldn’t reflect well on Eduardo Berizzo, who is still early in his reign. Athletic do normally employ a patient approach when it comes to coaches so he’s not under immediate danger but their inability to win games like this is a concern. The two meetings last term were both drawn. Athletic had won 6 in a row against Getafe prior to that. This Sunday’s game sees impressive new boys Real Valladolid travel to the Ramon Sanchez Pizjuan to take on a Sevilla side who are laying the foundations for at the very least a top four challenge. This will be a good test of both sides’ credentials with the visitors likely to come and park the bus. They’ve certainly been employing some very defensive tactics but it has largely brought results. They’ve only lost 1 of their last 8 league matches, a 2-0 defeat to Real Madrid when they more than held their own for 80 minutes at the Bernabeu twice rattling the woodwork against Santiago Solari’s men. That performance and impressive 1-0 away wins at Betis and Villarreal should serve as warning to Sevilla that this won’t necessarily be easy. It should be a real contrast of styles as Sevilla have been very positive this term playing with two strikers as well as two advanced widemen and an attack-minded number 10 in the shape of Pablo Sarabia. They overcame a similar kind of challenge to this one by beating Espanyol 2-1 in their most recent home game although only an 89th minute goal from Wissam Ben Yedder settled that one. Sevilla were 4-1 winners in the most recent meeting, at the Sanchez Pizjuan in March 2014. That ended a 5 game winless streak for them against Valladolid. The third game this Sunday in La Liga comes from Barcelona where the division’s two less fashionable Catalan clubs are meeting. Girona claimed a famous win on this ground last season, one of their standout results in their first ever top flight season but the chances of a repeat look considerably thinner this time around with Espanyol in great form at home. Rubi’s men are having a great season overall and currently sit in 5th place heading into match-day 13. They did suffer late heartbreak just before the international break, conceding an 89th minute goal to lose 2-1 at Sevilla. They’d actually led that game heading into the final twenty minutes so it was a rare disappointment for them but they’ll be looking forward to getting back on home soil here. Girona are only 4 points back on Espanyol but the general consensus is that they’ve rode their luck at times. Brilliant goalkeeping displays from their Moroccan keeper Bono have largely been the reason for some impressive away results such as a 1-0 win at Valencia and 0-0 draw at Sociedad. They are actually unbeaten in 5 games but were again quite fortunate to scrape a draw at home to lowly Leganes last time out. Some fairly significant injury problems haven’t helped matters and Eusebio will be delighted by some of their recent results but it’s hard to see a similar level of performance yielding any points here. That is largely because Espanyol have been exceptional at home and have the division’s only 100% home record heading into this game. Defensive qualities have been the main reason for that with recent Spain call-up Mario Hermoso marshalling things. He made his international debut in midweek and has been linked with a move back to Real Madrid but for now he is a big reason why Espanyol have let in just one home goal all season until this point. Girona haven’t lost away yet but that has been as much by luck and brilliant goalkeeping rather than judgement. They faced 25 shots and needed their keeper to make 9 saves in their recent 1-0 win at the Mestalla and also benefited from marginal VAR calls. Their luck will surely run out soon and backing Espanyol to Win looks good here with Rubi’s side having been so consistent at home. Both meetings last term produced away wins to nil. The sides hadn’t previously met competitively this century. Betis come into this Sunday’s game in La Liga on the back of an inspired performance as they ran out 4-3 winners at Camp Nou to inflict on Barcelona their first home league defeat in over two years. That should give them great confidence heading into this game against a Villarreal side that will be lacking it after a slow start to the season. It’s a surprise to many that Javier Calleja has managed to hold onto his job for this long. It’s perhaps worth noting that his side are currently 2 places and 3 points behind Celta Vigo, a side of whom less is expected of but one that sacked their coach over the international break. Nicola Sansone’s fine late strike to earn Villarreal a point at Rayo last time out may have earned him a stay of execution for now but the performance against struggling opposition did little to inspire confidence. Betis meanwhile were brilliant in their last match, becoming the first visiting side in 15 years to score 4 goals in a league game at Camp Nou. Quique Setien has won many plaudits for his team’s style and quality but the one fact that has been overlooked a touch is that they are still only 12th in the division. While the demands of European football have made life a bit tougher for Betis, they do need to add greater consistency in a season in which they’ve already beaten Sevilla, Milan and Barcelona. Overall they look very long with the bookies here though when you consider the quality of their last display and particularly how poor Villarreal have been at home. The Yellow Submarine are yet to win at home this season in La Liga. Their average of 0.5 points per home game is desperately poor for a side with European ambitions and only Huesca have picked up fewer points in front of their own fans this term. They lack a clear identity or style of play and the new signings have taken time to gel, a big reason why they’ve won just twice all season in La Liga. Betis meanwhile have a much clearer philosophy and you sense their summer arrivals are starting to deliver. They come into this one unbeaten in 4 matches in all competitions and backing Betis Double Chance appeals here. Going for Giovani Lo Celso to score anytime could also be worth considering. The PSG loanee has scored some stunning goals already and has found the net in 3 of his last 5 appearances for Betis. Betis were 2-1 winners at home in February to end a 3 game losing streak against Villarreal. They’ve not won on any of their last 6 trips to the Ceramica, losing 4. The Monday night game in La Liga this week comes from San Sebastian where Real Sociedad are still waiting for their first home win of the new season. They take on a Celta Vigo side that somewhat surprisingly made a managerial switch over the international break and this promises to be a decent contest between two fairly evenly matched sides. Celta ended the last round of fixtures just 3 points off 7th place, which is normally good enough for European football. However the Celta board still decided to call time on Antonio Mohamed’s short but entertaining stint as boss of the Galician club with a 4-2 defeat to Real Madrid proving to be his final game. His replacement is Miguel Cardoso, who only recently left Nantes with his 8 games at the helm yielding only 6 points. It’s a bit of a surprise move from the Galician club with Cardoso having also previously served as the assistant boss at Celta’s bitter local rivals Deportivo La Coruna. It’ll be interesting to see how the changes affects their approach here against a Real Sociedad side that has blown hot and cold this term to some extent, reserving their best performances for away games. They average 1.86 points per game on the road and have claimed more away points than any other team in La Liga. Their most recent success came courtesy of a fine late rally that saw them score 3 goals in 10 minutes to come back to win at Levante. However on home soil they’ve been far less convincing and are yet to taste victory at the newly renovated Anoeta. The absence of key midfielder Asier Illarramendi to suspension will make their task all the harder here and with the likes of Girona and Rayo having already got results at the Anoeta this term, there looks to be value in backing Celta Vigo Double Chance and the appointment of a new coach could generate a response, not that their recent displays have been terrible. The last 6 competitive meetings have produced 2 wins each and 2 draws. Celta have won on 2 of their last 3 league visits to the Anoeta.